This is the last installment of the vacation review! 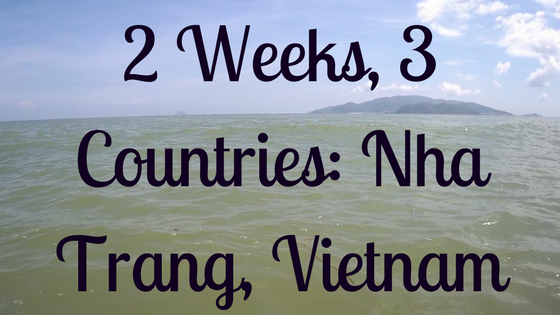 For our last stop of our vacation, we went to Nha Trang, Vietnam for the beach. I don't have as many pictures from Vietnam as I did for the others as we did a lot of stuff at the hotel or the beach and a lot of the pictures were on snapchat or our action cam so the quality is not the greatest. 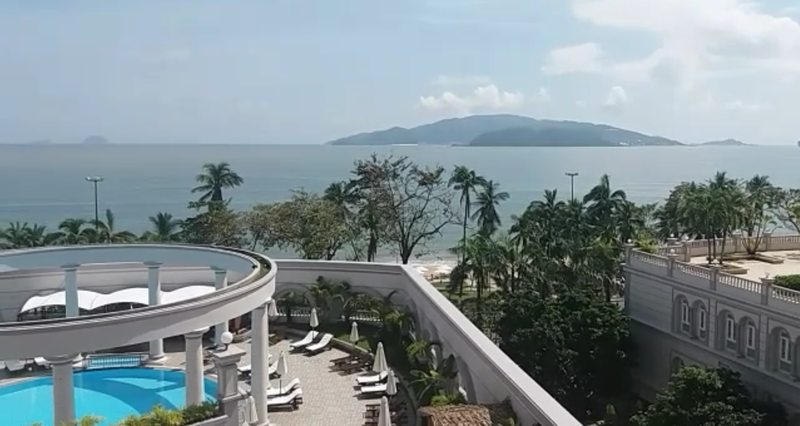 We arrived at our hotel, Sunrise Beach Hotel & Spa, which was a resort style hotel. I chose it because I wanted a nice place with a private beach so that we could just relax. It was nice but a little expensive compared to Suorkear in Siem Reap which was just as nice or nicer. They provided water but not a whole lot and Mark and I drink a ton of water, so we went out and tried to find a convenience store and somewhere to eat. We struggled to find anywhere to eat and didn't manage to find a real convenience store. We did find somewhere that sold the lovely big water bottles that Asia has so we got water and walked back to the hotel. That night they had a Japanese buffet that we ended up eating. They didn't have much that I liked because it was mostly weird fish dishes but Mark enjoyed it. Then we went up and went to bed. Today we woke up and ate breakfast and one of the best parts of the Sunrise was the delicious breakfast. They had a buffet with everything from American continental breakfast foods to Asian breakfast foods. My favorite thing was the croissants and fancy cheese, so I mostly ate that because I never get to eat croissants. After breakfast, we got ready for the beach and we went to the beach. The hotel had a private beach and beach chairs with towels, so we got some chairs, an umbrella, and towels and set up our stuff. We went in the ocean for a bit and the water, at that time the water was clear and the perfect temperature and the waves weren't too big. For the next 5 hours, we played in the ocean and sat on our chairs and read our books. It was so relaxing and the sound of the ocean was nice. When we got hungry, we walked along the beach and tried to find a place to eat. But again, we couldn't find one that appealed to us and there were no beach showers so I was sticky and gross feeling from the saltwater, sunscreen, and sweat so I just wasn't in the mood to be walking around, dodging traffic, looking for a place to eat. We found a convenience store and got some more water and went back to the hotel to shower. After our showers, we went out again to find food. We got flagged down by an unlimited food and drink buffet and we decided to eat there. Again, they didn't have much that I really liked. They had a lot of different seafood and weird meats to try, well weird to me like crocodile, and not much else so I ate a lot of rolls lol. After we ate, we went back to the hotel and decided to try their Sky Lounge. We got a couple drinks and sat on the balcony of the lounge and just listened to and watched the ocean. We decided that we enjoyed the ocean so much that we should go walk along the beach. So we did and it was so nice to just walk and talk along the ocean. We last minute, impulsively booked a tour through the hotel. But, we ended up kind of regretting it and wished we had spent the day at the beach. But we left the hotel with the guide and driver and we went to the first temple, Long Son Pagoda, where we were able to go inside and look around, then we hiked a small hill from there where we saw a huge white Buddha statue. 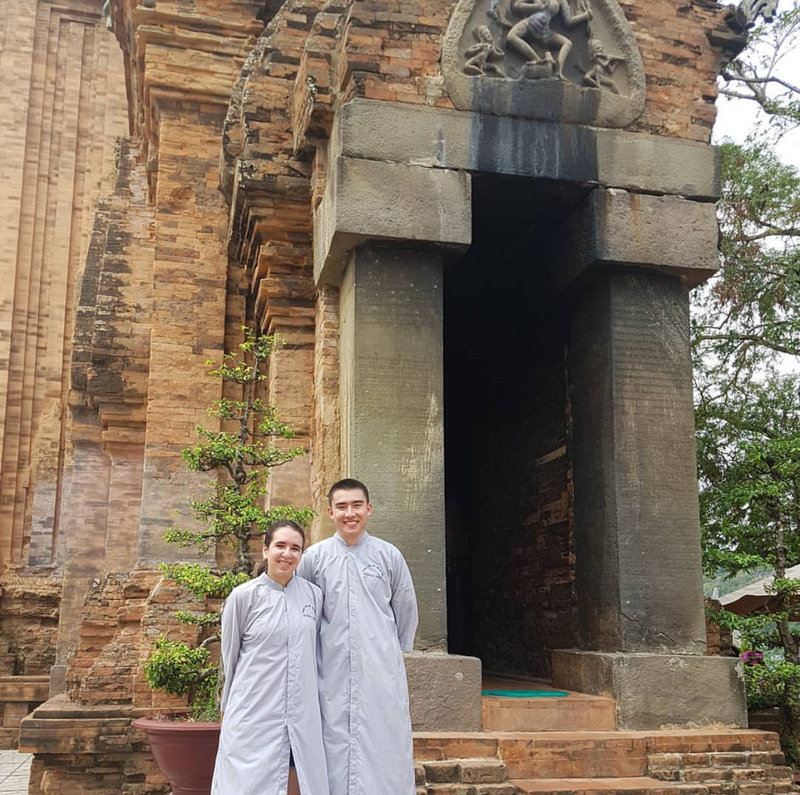 After that, we went to a rock formation, Ho Chong, in the ocean where a lot of boulders were perched precariously on top of each other and we saw a mini-concert using traditional Vietnamese instruments. Then we went to another temple, Po Nagar Cham Towers, where we explored the temples and we saw a traditional prayer dance. After that, we went to iResort where we got to lounge in a mud bath and hot springs. The mud bath was interesting, not thick like we thought but just watery mud. It would have been really relaxing except it was so hot out and then the mud bath was warm.After the mud bath, we rinsed off and got in the hot springs waterfall, which again, would have been nice but it was so hot! We ended that part of the day early because we were like "why should we stay here where its hot water and a dirty 'beach' when we could go to an actual beach. So we ate some pho and left the resort. We went to a market where the tour guide explained the different areas and the different foods and helped us bargain and translate. We finally got back to the hotel and we changed and went to the beach again. But man, today the waves were so rough and the water was murky, it was still rainy season so that was to be expected. We fought the waves for a bit but got tired so we lounged on the chairs and read our books. We got cold and hungry after about an hour and a half so we went back to the hotel, showered, and decided to eat at the hotel restaurant. We shared a delicious caesar salad, I got a club sandwich that had an egg on it, which was really good, and Mark got a pizza. After eating, we went back up the Sky lounge because we enjoyed the view, but again, after a little while we decided to go walk along the beach again. I really wanted to try snorkeling while we were at the ocean, so that's what we did today. It was about a 20-minute boat ride to the snorkeling area. We got in the water and I quickly learned that my snorkel was not on correctly when I breathed in all kinds of water. We got it fixed and went on our way. At first, it was a little panic-inducing, I didn't actually start panicking but it took some mind control and breathing to calm the instinctual fear of breathing underwater. Unfortunately, every now and again, I would breathe in water, but I got better at dealing with it as we snorkeled. It was fun swimming through the coral and seeing the colorful saltwater fish. I really enjoyed finding a cool fish and following it to see that fishy business it had to do. Often they would lead me to some cool spots. I also loved when schools of fish would swim by. Sadly, the coral wasn't that vibrant and there was some trash which is a sad part of human's effects on the ocean. After the snorkeling, we got room service lunch and we sat on our balcony and ate our lunch while we watched the ocean. It started raining so we weren't able to go to the beach, plus we were tired from being in the water all morning. So we just relaxed in the room and watched movies. Today was the day we left and I was planning to spend the morning sitting on the beach. Not playing in the ocean, just sitting on the beach and enjoying the sound. But we woke up and it was pouring. We ate breakfast and after breakfast, saw that it was starting to slow down, so we ended up being able to walk along the beach one more time. For most of it, we just stood and watched the huge waves come in. We left after about 40 minutes and right when we got to the hotel it started pouring rain again so we got back just in time. Then we started our travel day home. Overall, Vietnam was our least favorite place. Maybe Vietnam wasn't for us or we just didn't go to the right area or at the right time. We just didn't find the area to be easy to navigate and the beach wasn't as impressive as all the travel sites said. I think if we do southeast Asia again, we'll do either Phuket, Thailand (because we LOVED Thailand), the Philippines, or Bali for the beach/relaxing part. I am a little sad that vacation ended so quick. We had a wonderful time experiencing new places and new cultures together. It was so nice not having to share Mark with his job or other people, it was nice just spending time together especially with how much he has to work now. Want to know more about our vacation? Check out the posts about Siem Reap, Cambodia and Chiang Mai, Thailand.